Last weekend I was in asparagus. 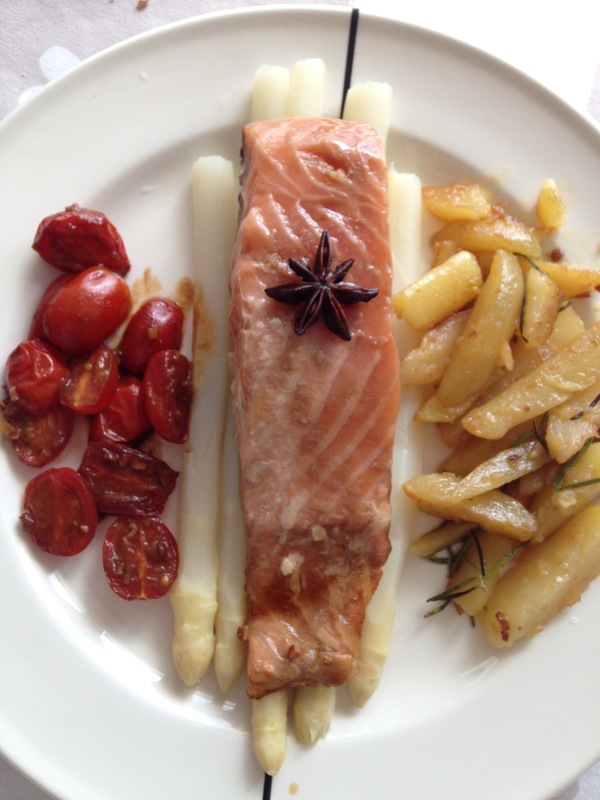 On Saturday the salad with strawberries, on Sunday a self made combination with salmon and star anise. The idea for the marinated salmon comes from a completely different recipe. Cut the ginger and garlic into fine pieces. Mix the soy sauce, oyster sauce and sherry and add the chopped herbs to it. Marinate the salmon steaks on all sides with the sauce. Pop the star anise in the sauce, cover it and put the salmon marinade for 4-6 hours in the refrigerator. Peel the potatoes, cut them into wedges and cook them. Peel the asparagus and cut its bottom pieces. Cook the asparagus for 10 minutes. Cook the potatoes with rosemary. Remove the salmon from the refrigerator, remove the ginger and garlic pieces, put the star anise on the salmon and wrap in aluminum foil. Bake the salmon for about 10 minutes in the oven. Then turn the oven off and let cook further in the film. Arrange all the plates and serve.